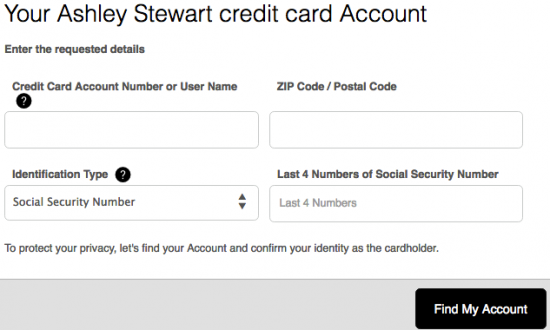 Owners of the Ashley Stewart Credit Card are able to keep track of their finances through the use of a Comenity Bank online account. By using the financial tools that Comenity has made available, users can fully manage their credit card from the comfort of their home office or even on the go with mobile banking. Comenity’s secure online portal allows cardholders to check their balance, review previous purchases, pay bills, make changes to personal settings, and perform nearly all financial transactions available when banking in person. All information necessary to get started has been provided within this page including the steps involved in getting a newly received credit card activated. For a detailed look at what’s required of you to bank online, scroll down to our instructional guides below. Start by going to this website where the login menu can be found on the left of your screen. In the two empty spaces, enter your User Name and Password. 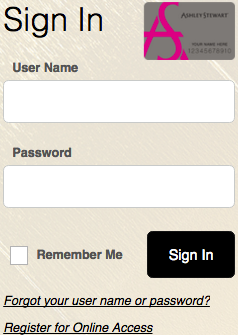 You can save your login credentials to expedite the future login times by clicking the Remember Me option. When you’re ready, click Sign In to gain entry to your online account. 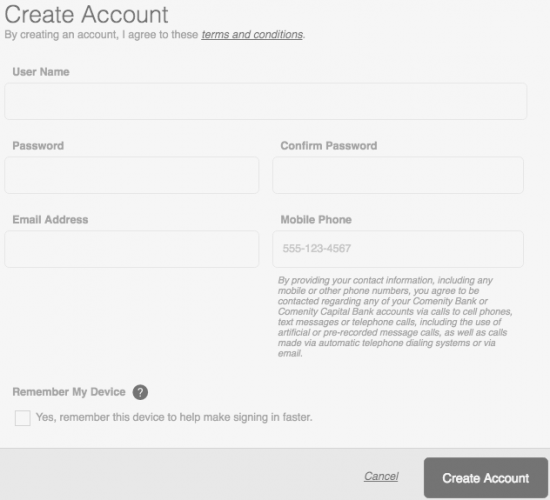 If you’re experiencing difficulty logging in due to a forgotten user name or password, click on the Forgot your user name or password? link located just below the login fields. This link will take you to a retrieval page that has four empty spaces in which you must supply your Credit Card Account Number or User Name, Zip/Postal Code, Identification Type, and the Last 4 Numbers of (your identification type). Click Find My Account to proceed and follow the instructions provided on the subsequent page to complete the process. Activating your card can be accomplished by calling 1 (800) 376-0581 and talking to a representative in customer service who will assist you through the process. Once your card is activated, click on the Secure registration link found above this paragraph to start the enrollment process for an online account with Comenity Bank. On the registration webpage, enter your Credit Card Account Number, Zip/Postal Code, Identification Type, and the Last 4 Numbers of (your identification type). Click Find My Account after you’ve supplied your information. Type in your desired User Name in the first available field and, in the two spaces just below, enter your Password. You’ll also need to provide your Email Address and Mobile Phone Number. Click Create Account after supplying that information. Here you can select the preferred delivery method for your bank statements. 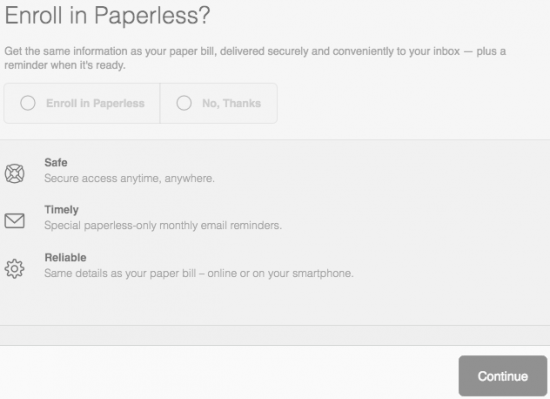 Select either Enroll in Paperless to receive electronic statements, or select No, Thanks to receive your statements by mail. Click Continue to proceed and follow the prompts found on the subsequent pages to complete the registration process. Your account should now be registered with Comenity Bank and ready for use! We hope that this tutorial has helped you today and we would like to welcome you back whenever credit card assistance is required.